After banding together to upend the mattress business, the company’s five founders are now facing their biggest challenge: what comes next. When Casper launched three and a half years ago, its five founders—Flateman, CEO Philip Krim, COO Neil Parikh, chief creative officer Luke Sherwin, and chief product officer Jeff Chapin—had no clue there would soon be so much to celebrate. They knew they had a strong idea, but back then their vision was modest. Mattresses were a $7 billion industry dominated by a tiny group of highly consolidated manufacturers and retailers. Markups were sky-high, sometimes topping 100%, and the shopping process was widely perceived to be unpleasant and confusing. It seemed possible that a nimble, low-overhead online player with a veneer of cool—the Warby Parker model, essentially—could capture a small-but-profitable slice of that market, despite the conventional wisdom that no one in their right mind would buy a mattress without at least flopping down on it for a few minutes at their local retailer. Before the founders had shipped a single one of their blue-and-white boxes, each packed with a near-magically expanding rolled-up mattress, it was clear they had hugely underestimated just how good their idea was. Orders came flooding in so fast that the company depleted its initial inventory on the very first day. 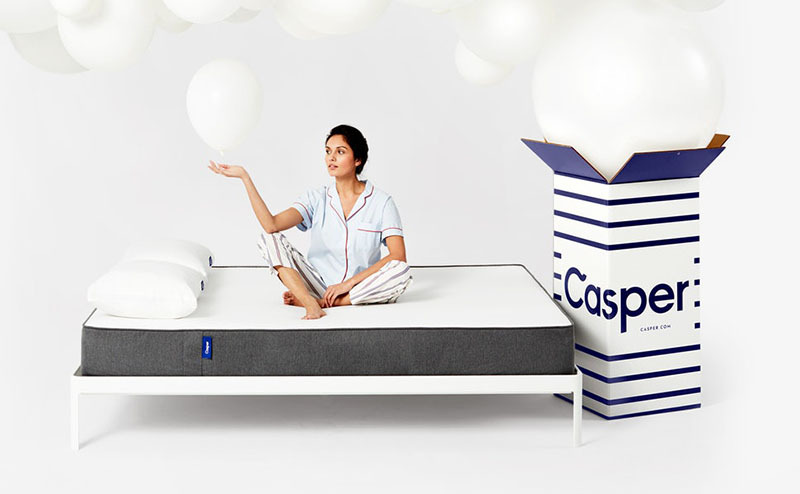 Within eight weeks Casper had surpassed its original 18-month sales goal, and within a year the young company had dramatically reshaped the industry it originally planned to nibble at from the edges. If you ask the founders what accounts for their rocketlike ascent, they all say it’s the unique perspective each of them brings—that there are major advantages to having five strong points of view and five different sets of expertise rather than a single domineering vision in the Jobs or Zuckerberg mold. Krim, they all say, has a unique instinct for marketing and a calm demeanor that makes him the ideal CEO. Parikh is the most natural salesman of the bunch—Chapin describes him as “magnetic, just a person that people are drawn to.” Sherwin has a knack for brand-boosting ideas like the Casper Nap Tour, in which a fleet of bed-equipped trucks roam places like South by Southwest offering daytime snoozes. Flateman—who taught himself to code and built Casper’s original, totally bespoke web store—is obsessed with systems and full of factoids like “UPS drivers [mostly] turn right.” (Which is true; look it up!) And all four of them, along with most of their coworkers, seem quietly in awe of the somewhat older Chapin, who spent a decade as a star designer at Ideo before turning his attention to mattresses. At the center of this looms one big question: What should Casper be? Is it a company known for making one game-changing product and delivering the best possible experience? Or is it something bigger: a platform through which to launch a variety of loosely connected items that all live under the Casper brand? And if it’s the latter, just what does Casper stand for, anyway? This debate has preoccupied the founders since the beginning, when they were scrambling to scale fast enough to just meet demand for their core mattress. On one hand, there were customers asking for ever more products; on the other was a whole host of potential bottlenecks: from a perfectionist design chief and complicated delivery logistics to implementing a seamless customer-service experience and recruiting experts from Google and Amazon to help solve these problems. Around the same time, Krim was coming to a similar conclusion. Then a college student at the University of Texas at Austin, he was already entrepreneurial. He had launched an early e-commerce business out of his dorm room, selling everything from blinds to futons—basically anything that could be purchased wholesale from a supplier and shipped directly from the factory to the customer. One of those products, foam mattresses, turned out to have a particularly high profit margin. “That industry was always very behind on embracing technology and anything new,” says the CEO, who has a more buttoned-down style than his colleagues. One day, Parikh heard a friend of Krim’s jokingly refer to him as the “mattress mogul.””I was like, ‘Why would he call you that?’ ” Parikh says. “And he told us the story about how he used to sell beds online, and the industry is a total racket.” They were all keenly interested in the emerging class of e-commerce firms like Warby Parker, Harry’s razors, and Bonobos. “Companies that came along and said, ‘Hey, there’s a broken category’ and were creating the same product at a much lower price,” says Parikh. On the same day as the balloon-man party, Chapin’s West Coast team had its own third-anniversary celebration, and the mood was decidedly more low-key—a trip to a make-your-own-ceramics spot, a few pizzas, some beers at a dive bar. As Casper plots its next phase, some healthy tension has developed between its two coastal operations: the sales-driven mothership in New York and the design-and-engineering-focused satellite in San Francisco. Chapin’s top priority is to nail the products—something now expected by the passionate followers of the brand that Casper has carefully built. When developing its $125-and-up dog bed, which Casper released last year to strong sales and a jolt of media buzz, Chapin’s team went through dozens of prototypes, each rigorously assessed by actual dogs. (Casper only semi-jokingly refers to the process as “canine-centered design.”) Early this summer, the company rolled out its eighth major item, a $250-plus duck-down duvet, after more than a year of iteration and testing. Chapin experimented with all kinds of synthetic insulation, before settling on down as the most breathable, comfortable, temperature-regulating solution. The shell is made of special featherweight cotton, making the entire thing more cloudlike, and it’s stitched together with baffles inspired by winter puffer coats, keeping the down from clumping. Meanwhile, in New York, everyone is pushing to amp up the pace. “We’re always wanting to launch stuff,” says Parikh. “We have customers calling every day saying, ‘I want this, I want this, I want this!’ [Chapin] is like, ‘I hear you, and I want the same thing, but I’m not going to launch this product until it is absolutely perfect.’ ”This summer, Casper opened a new R&D facility in San Francisco, which now allows Chapin’s team to both move faster and push the company forward in several directions at once. They can experiment more with new materials and forms in-house, discovering whether production might be viable without requiring a vendor partner to participate in the research phase. There is also now a team focusing entirely on packaging design, which used to involve a protracted process of sending specs to a vendor, getting samples, and tweaking them over the course of a couple months. Today, using in-house prototyping, “our designers can design it, print it, check it,” Chapin says. “What took six or eight weeks now takes three days.” Casper is also tapping an army of 30,000 fans around the world, who have volunteered to sign NDAs and help with the testing. When Casper launched, one of the core assumptions was that the products would mostly appeal to tech-inclined millennials, the group most comfortable with making major purchases online. That turned out to be wrong: Casper’s demographics aren’t much different from those of the mattress industry as a whole—its customers come from every age group and every part of the country. But as much progress as Casper has made in persuading Americans to try out their concept, 90% of shoppers still buy mattresses from a physical store, Krim says. In May, Casper—which has begun making tentative plans for an IPO—announced a new partnership with Target, which invested $75 million in the company amid reports that it had offered to acquire Casper outright for $1 billion. (The investment is part of a larger funding round worth a reported $170 million.) The deal has put its non-mattress products in 1,200 Target stores nationwide, reaching huge numbers of potential new customers. “The idea of getting in front of so many demographic areas that have never heard of us?” says Parikh. “It’s just so compelling.” At the same time, Casper’s own site, which is overseen by Flateman, continues to evolve. Customers in several cities, including New York and Los Angeles, can now order a mattress and often get it delivered in not much more time than it takes to get a pizza: 90 minutes or less.These moves, the founders hope, will both broaden and better define the Casper brand, and will also help it stay ahead of the dozens of companies it has inspired. Competition is a major worry, with both Big Mattress and other startups angling for Casper’s customers. “The reason there are so many look-alikes out there is that it’s an industry with a very low cost of entry,” says mattress-industry analyst Jerry Epperson Jr., a managing director of the investment firm Mann, Armistead & Epperson. “But Casper raised money early and has raised the most, and now that it has Target as a big brother it has a real competitive advantage. I don’t see any other [online mattress] that’s going to come up and become a more recognizable brand.” Still, there’s quite a bit of pressure to stay ahead, which is why the New York founders are so keen to push the California product-development operation to move faster.